Democratic Republic of the Congo, a country in Central Africa bordered by Central African Republic, Sudan, Uganda, Rwanda, Burundi, Zambia, Angola, and a small Atlantic coastline, has a total land area of 905,355 square miles and a population of over 70.9 million.The Second Congo War, beginning in 1998, devastated the country, involved seven foreign armies and is sometimes referred to as the "African World War". Despite the signing of peace accords in 2003, fighting continues in the east of the country. It has five national parks listed as World Heritage Sites and they are all in danger. Congo Bradt Travel Guide 978-1841622330 $21 The Best Available Guide Book on Congo. The first 60 pages are general background and practical travel information and forms Part I. Part II is coverage of Democratic Republic of Congo spanning about 150 pages with region-wise coverage and its own background and practical travel information sections. Part III is coverage of Republic of Congo. The first stamps of the Democratic Republic of the Congo (Zaire at the time) were a set of three stamps released on December 18, 1971 to mark the 25th anniversary of UNICEF. The set (Scott #750 to #752) catalogs for around $3 MNH and around half that for used. The designs show UNICEF emblem along with mother, child, and caregiver, map of Africa showing Zaire, and boy in African Village. The set was followed by another set of three stamps in 1972 showing President Mobutu and MPR Emblem to mark the fifth anniversary of the People’s Revolutionary Movement (MPR). The set (Scott #753 to #755) catalogs for around $10 MNH and a little less for used. The country achieved independence on June 30, 1960 as the Republic of Congo. Prior to that, it was the Belgian colony of Belgian Congo. Following a coup in 1965, the country was renamed as the Democratic Republic of the Congo. In 1971, the name was changed to Republic of Zaire when the country was under the ‘kleptocracy’ of Mobutu. 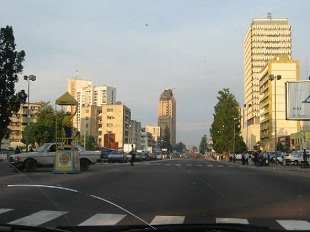 The country was renamed Democratic Republic of the Congo in 1997. A set of eight stamps released in 1975 to mark the tenth anniversary of new government showing local scenes. The set (Scott #828 to #835) catalogs for around $7 MNH and around half that for used. The designs show Sozacom Apartment Building, Matadi Flour Mill, women parachutists, President Mobutu visiting Chairman Mao, soldiers working along the Salongo, President Mobutu addressing UN General Assembly, and celebrating crowd. A set of four strips of four stamps to mark PHIBELZA, the Belgium-Zaire Philatelic Exhibition. The set (Scott #982a-d to #985a-d) catalogs for around $20 MNH and around $13 used. The designs show Exhibition Emblem along with stamp on stamp designs with Belgium and Congo issues. A set of four stamps and a souvenir sheet released in 1990 showing Tourist Attractions. The set (Scott #1253 to #1256 and #1257) catalogs for around $10 MNH and around the same for used. The designs show waterfalls of Venus, rural village, Kivu Lake, Niyara Gongo volcano, and Kisantu Botanical Gardens. A set of six stamps released on March 7, 2002 showing Native Handicrafts. The set (Scott #1615 to #1620) catalogs for around $8 MNH or used. The designs show Tabwa buffalo mask, Kongo bedpost, Loi drum, Kuba Royal Statue, Tshokwe mask, and Luba mask. The first coin of Democratic Republic of the Congo (formerly Zaire) was a Republic Decimal Coinage (100 Makuta = 1 Zaire, from 1993 onwards – 3M old Zaires = 1 Nouveau Zaire) Silver 5 Zaires Proof issued in 1971 showing Bust of Mobuto in Obverse and Hotel Intercontinental in Reverse. It is valued around $35. The first gold coin was a 0.2882 troy ounce 10 Zaires Proof issued the same year in the same theme. That issue is valuable and catalogs for a very slight premium over bullion value. Antiques $15 and up 19th century maps, Luba Combs, Lega Masks etc start around $15. Bembe Statuettes, Metoko Masks, Beke Masks etc start around $40. Teke Statuettes, Lwalwa Face Masks, Luba Pregnant Power Figurines, etc go into the 100s. Kifwebe Masks, Chowke Masks, and other unusual and exquisitely crafted masks start around $1000. Art $15 and up 19th century local scenes photos, contemporary art sculpture carvings etc start around $15. Songye Shields, Nkisi Fetishes, etc start around $100. Miscellaneous Collectibles $5 and up Patches, Pins etc start around $5. Large fragments of tumbled free-form malachites, malachite animal carvings and other art work etc start around $15. Congo Military Merit Crosses, Luba Headrests, etc start around $30. Nyama Ancestral Figurines, Kuba War Shields, Healer’s Wood Mixing Bowls, etc go well into the 100s.